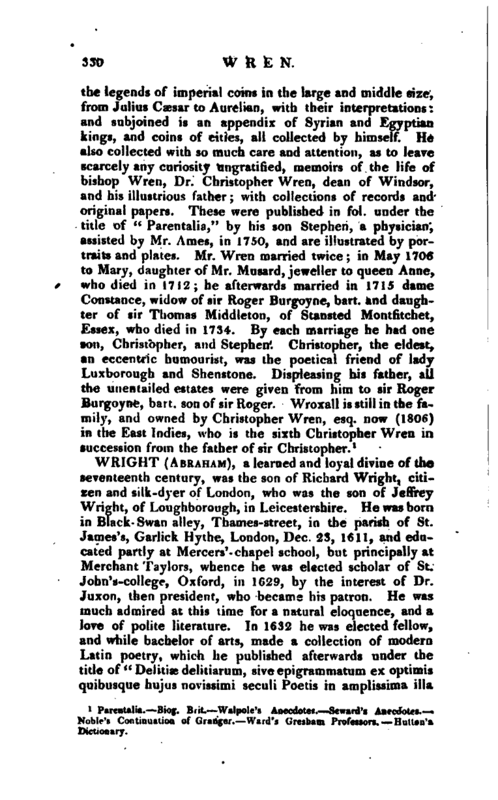 , a learned and loyal divine of the seventeenth century, was the son of Richard Wright, citizen and silk-dyer of London, who was the son of Jeffrey Wright, of Loughborough, in Leicestershire. He was born in Black- Swan alley, Thames-street, in the parish of St. James’s, Garlick Hythe, London, Dec. 23, 1611, and educated partly at Mercers’- chapel school, but principally at Merchant Taylors, whence he was elected scholar of St. JobnVcollege, Oxford, in 1629, by the interest of Dr. Juxon, then president, w/ho became his patron. He was much admired at this time for a natural eloquence, and a love of polite literature. In 1632 he was elected fellow, and while bachelor of arts, made a collection of modern Latin poetry, which he published afterwards under the title of “Delitiae delitiarum, siveepigrammatum ex optimis quibusque hujus novissimi seculi Poetis in amplissima ilia | Bibl. Bodleiana, et pene omnino alibi extantibus artthologia in unum corollum connexa,” Ox. 1637, 12mo. 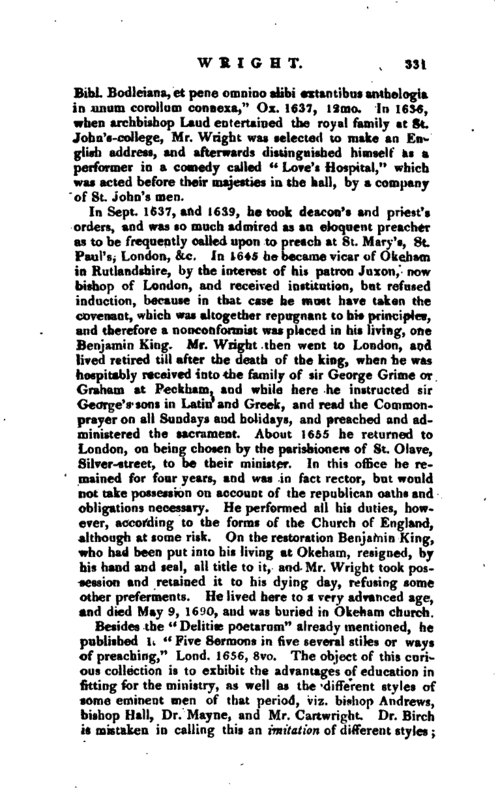 In 1636, when archbishop Laud entertained the royal family at St. JohnVcollege, Mr. Wright was selected to make an English address, and afterwards distinguished himself as a performer in a comedy called “Love’s Hospital,” which was acted before their majesties in the hall, by a company of St. John’s men. In Sept. 1637, and 1639, betook deacon’s and priest’s orders, and was so much admired as an eloquent preacher as to be frequently called upon to preach at St. Mary’s, St. Paul’s, London, &c, In 1645 he became vicar of Okeham in Rutlandshire, by the interest of his patron Jnxon, now bishop of London, and received institution, but refused induction, because in that case he must have taken the covenant, which was altogether repugnant to his principles, and therefore a nonconformist was placed in his living, one Benjamin King. 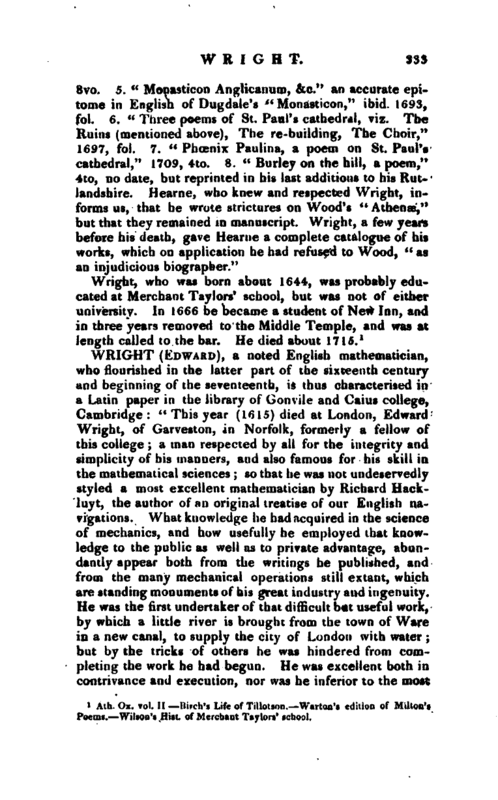 Mr. Wright then went to London, and lived retired till after the death of the king, when he was hospitably received into the family of sir George Grime or Graham at Peckham, and while here he instructed sir George’s sons in Latin and Greek, and read the Commonprayer on all Sundays and holidays, and preached and administered the sacrament. About 1655 he returned to London, on being chosen by the parishioners of St. Olave, Silver-street, to be their minister. In this office he remained for four years, and was in fact rector, but would not take possession on account of the republican oaths and obligations necessary. He performed all his duties, however, according to the forms of the Church of England, although at some risk. On the restoration Benjamin King, who had been put into his living at Okeham, resigned, by his hand and seal, all title to it, and Mr. Wright took possession and retained it to his dying day, refusing some other preferments. He lived here to a very advanced age, and died May 9, 1690, and was buried in Okeham church. Besides the “Delitiae paetarum” already mentioned, he published 1. “Five Sermons in five several stiles or ways of preaching,” Lond. 1656, 8vo. The object of this curious collection is to exhibit the advantages of education in fitting for the ministry, as well as the different styles of some eminent men of that period, viz. bishop Andrews, bishop Hall, Dr. Mayne, and Mr. Cartwright. Dr. Birch is mistaken in calling this an imitation of different stjles; | it is a selection from the works of the respective authors, 2. “A practical commentary, or exposition on the hook of Psalms,” Lond. 1661, fol. 3. “Practical Commentary on the Pentateuch,” ibid. fol. 4. “Parnassus biceps, or several choice pieces of poetry, composed by the best wits that were in both the universities before their dissolution,” ibid. 1656, 8vo. He wrote some other works which have not been printed. 1 Ath. Ox. vol. 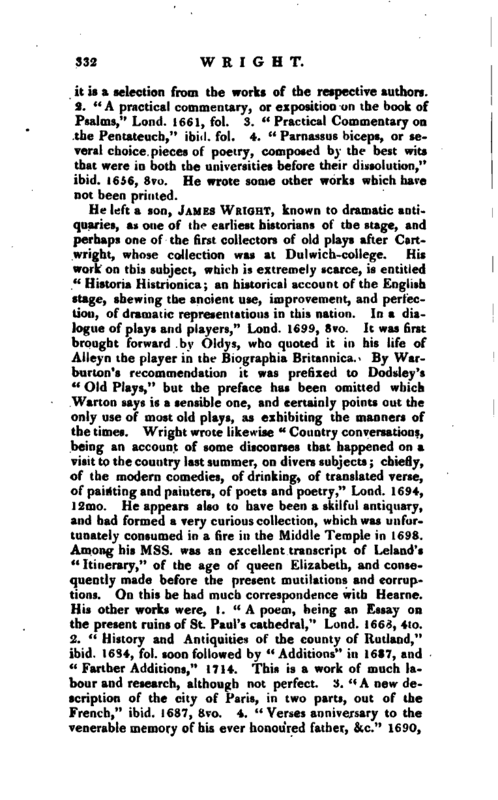 II lurch’s Life of Tillotson.-^-Warton’s edition of Milton’s Wilson’s Hist, of Merchant Taylors* school.